Subj: Hal Jordan and the Green Lantern Corps #41 - The Law and The General. "You Have To Believe In Right Versus Wrong. In The Strength Of Justice Over Injustice. The Rule Of Law." I'm well aware that I haven't been posting reviews, or much else, of late, and there has been a reason for that. 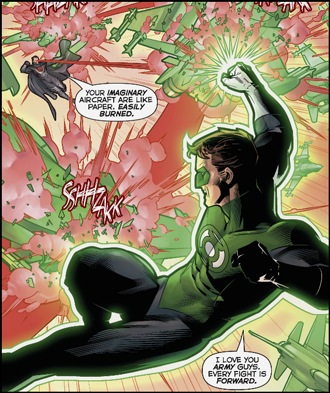 In an effort to get back into the routine, and rehone the discipline needed, I shall therefore make a renewed effort to post more from now on, and will take the time here to (again) congratulate and thank Robert venditti for his sterling work on developing the character of Hal Jordan and simultaneously raising the standard of his ongoing series. With the latest storyline, pitting DCs most willful character and intergalactic poileman against the fascist will of Krypton's greatest General, now coming to a satisfying and duly exciting conclusion one might opt to focus on the actual physical clash being played out in this issue. Brandon Peterson's artwork has certainly changed over the years, and it may be that he has deliberately decided to mimic the style that this books previous artist (Rafa Sandoval), but either way the effect and precision of his work is to the book, and the story's, great advantage. 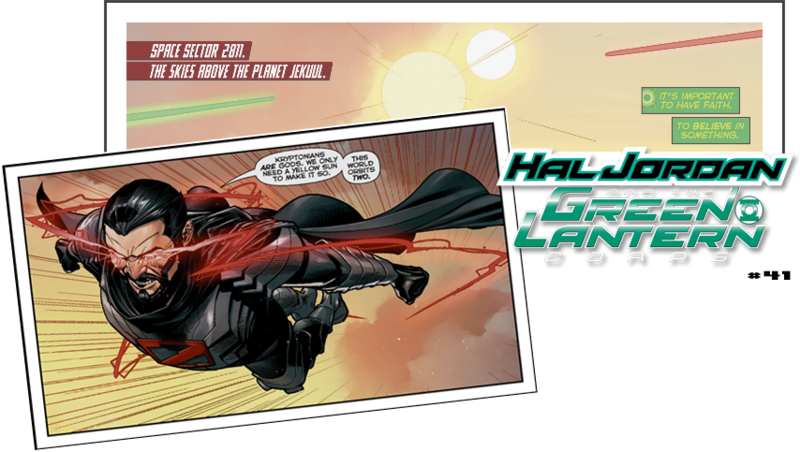 From that opening page with two suns silhouetting the approaching head-on clash of two titans, interspersed with shots of the two factions watching on below in awe and anticipation, everything about Venditti's scripting is carefully calibrated to deliver the best results and effect required for Hal Jordan's one-man stand against the overwhelming might of General Zod. That opening page is a fine example of a writer who understands the need for a suitable payoff. In many ways Hal Jordan... #41 is a very traditionally done Superhero Vs. Supervillain clash, with the hero having been overwhelmed previously by his superior opposition the question is left as to how he can recover and what precisely he can do to defeat such a provenly superior force. All very conventional Superheroics then. And all very well constructed. There does lie an extra value with Venditti's plotting however aas while the physical spectacle is there to satisfy one element of the thrill seeking audience the writer skillfully plays to a wider spectrum of readership by adding a rather compelling rationale to the apparent despot of General Zod and his family by linking to an often downplayed element of old near forgotten continuity way back in Superman #257 (1972), a short story concerning the failure of Green Lantern Tomar-Re to save the planet Krypton. Quite how Zod and his family are aware of Tomar-Re's actions that day is left unanswered, but the pretext does allow for some suitable sense of justification in the presentday for Zod by which he can attain some sense of the moral high ground over the challenge of the Green Lantern Corps to his family's refuge on a new world and its unsuspecting peoples. This situation in itself is a more subtle example of the themes of authority, protocol, and when and how that authority should be challenged or, grudgingly, respected. If one were to pick a particular villain from another characters rogues gallery then at face value General Zod may seem an unfair and strange pick to face Green Lantern. But Hal Jordan's clash against the Willful and dominating presence of General Zod doesn't play out as being an odd choice at all, As Venditti showed a surprising awareness of Kryptonian continuity - with the General previously reminiscing on the wonders of "Thought Beasts" and "Volcanoes of Gold spewing lava" - the writer will no doubt be more than aware of Hal's own history and ingrained rebellious nature in regards to authority figures. Whether it be the Guardian of the Universe, the Batman in Green Lantern:Rebirth, or the unfortunate General Stone in Geoff Johns and Carlos Pacheco's Green Lantern #3, all of these are clearly defined precursors to the instinctive reflex Hal has to Authority figures. Even by this very issues end John Stewart himself doesn't escape a strong challenge over his decision making over the Zod affair from Hal. And in facing, arguably, the most well reknowned authoritarian corrupt and fascist of DCs military orientated villains Venditti not only succeeds in staying entirely true to the Hal Jordan character but sets up a compelling true clash of the Titans the likes of which doesn't come around very often in the genre anymore... As the book opens with that first page the previous three books scarcely even matter, as even the newcomer can sense from the drama of it that this is something monumental occuring. 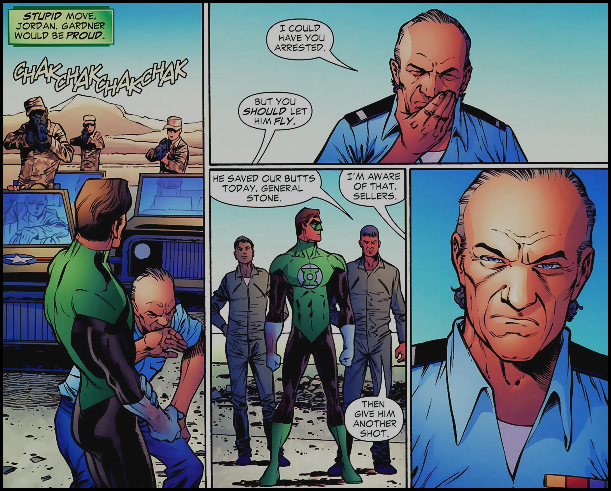 And as the callous Will of the experienced military man General Zod meets the fiercely independent Will of Hal Jordan/Green Lantern there are some clear echoes of Hal's many clashes with the similar figure of Sinestro to be had. Unlike Sinestro though this is not a contest of so much skill, as pure will. And as the General relies on just brute force to face the Lantern therein lies perhaps his critical error, as quite unlike his clashes with archrival Superman this is no contest of brute force in facing Hal Jordan, rather it is a literal clash of Wills - played out on a two-tier level as a physical and figurative demonstration of who's Will is the stronger. The General chose the tactics he felt appropriate. And in doing so revealed his own deficiencies before his own family and peoples as commander and man... a humiliation that would be hard to reconcile and come to terms with for most. But ego steps into force with Zod to allow him justifiable denial on the matter, Hal Jordan's clear superiority can be duly swept under the metaphorical carpet as Zod's longer range plan conveniently bears him full results... in every sense of the word then he lives to fight another day. Whether the belief the peoples of Jekuul have invested in him remain so however is a question that surely now will gain a life of its own. Questions have surely been raised even in this peoples most faithful of followers, the rule of law must be followed yes, but now the question must surely begin to be asked - as to who's law? In truth there are very very few book from the DC/Marvel stable today that I can say are genuinely enjoyable and of quality. But Robert Venditti's Green Lantern is consistently one of the three I look forward to.